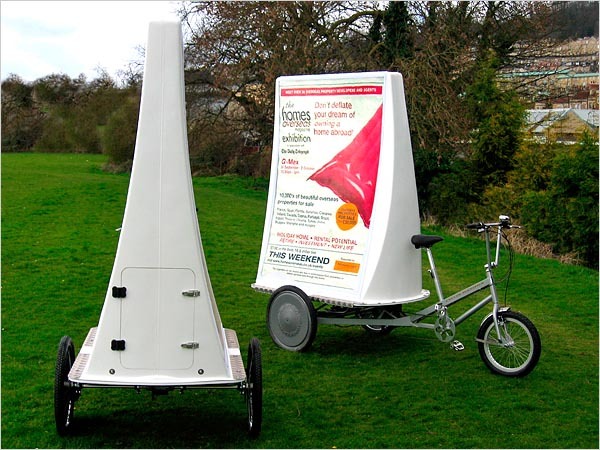 It is designed around the ‘6-sheet’ advertising standard 1200mm (4ft) X 1800mm (6ft) which is the most ubiquitous outdoor format. 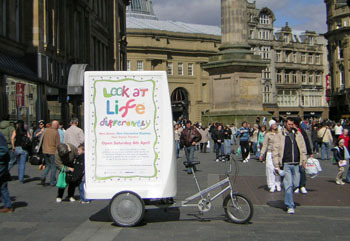 The Adtrike can usually get to advertise where other means are impossible (stealth advertising!). They can go anywhere a cycle is allowed to go. They have a rear door that allows for easy storage of sales leaflets and the riders personal items. 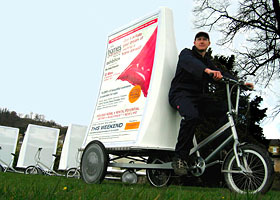 This makes them ideal as bases, for handing out leaflets and meeting the target audience on a 'one to one' level. The glass fibre is very thin behind the advert to allow for back lighting if the customer wishes. Sound systems can be easily added.